He is an aspiring rock star, but Yu Zhenhuan's claim to fame for now is that he is the hairiest man in all of China. Hair covers 96 percent of Yu's body. He may be surpassed only by a pair of Mexican brothers: Victor "Larry" and Gabriel "Danny" Ramos Gomez, listed in the Guinness Book of World Records as having 98 percent hair cover. The 26-year-old Yu is candid and unembarrassed about a condition that has made him a phenomenon in China since he was born. A stringy black fuzz matts every inch of his lanky frame, save for the palms of his hands and the soles of his feet. And Yu has chosen to make use of his unique physical appearance, placing photos of himself on his Web site www.maohai.com + or Hairboy.com + as part of a drive to land a recording contract and become China's newest rock star. But he recalls a time when he preferred not to face the music. 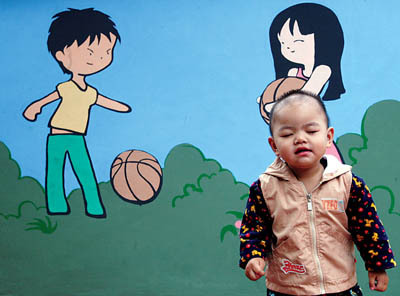 Born in Shenyang in the frozen northeastern province of Liaoning, Yu spent a tough childhood amid much finger-pointing. 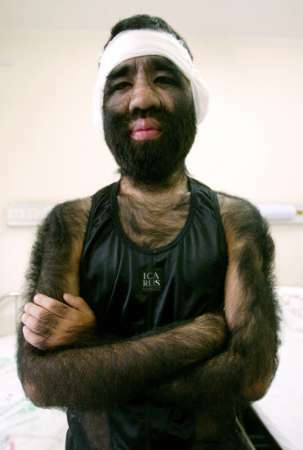 "People laughed at me and called me 'caveman'. I used to throw stones back and fight them as a kid, but now I've grown up and learnt how to endure it," he said as he recuperated in a hospital ward from ear surgery. He had the operation in Shanghai recently to remove hair that was impeding his hearing, doctors said. "I hope to prove myself and others wrong in singing some day. Of course, in the beginning, people will say, that's just "hairboy" singing. "But I want to rely on my skills to make it big," said Yu, his head wrapped in bandages. Yu made his entertainment debut at the age of six in a movie called "A Hairy Child's Adventure". Life has been far from easy. Yu has had five other operations to remove hair from his nose and repair his gums, which were engulfing his teeth. Yu, who uses the name "woolboy" in English for his email, is covered with an average of 41 hairs per sq cm (0.16 sq in) of his skin + a condition doctors call atavism. "I've had a lot of trouble having so much hair all over my body since I was young, physically and mentally. It's a price that I have to pay," said Yu, whose eyelashes are so long they hide his eyes. "I used to take it to heart, how people looked at me and said things about me," said Yu, who loves music and has stashed under his hospital bed a huge collection that ranges from Sting to Nat King Cole. "I didn't want to go outside, I didn't want others to see me, to talk to me, but I realised I needed to be@thick-skinned," he said, adding that he hoped that others with difficult physical conditions would be inspired by his readiness to seek publicity. Before the ear operation, he had problems hearing anything under 40 decibels. Now he can hear over 20 decibels, doctors said. A normal conversation is conducted at around 30 decibels. Yu's latest operation, which took four hours, was the first such procedure carried out in China. Doctors said Yu had a close shave. "There was so much discharge stuck in the inner part of his ears that they were infected. The infection could have spread to his brain if he hadn't done something about it," said Chen Jin'an, director of Shanghai's Ninth People's Hospital's plastic surgery department. "When people tease or despise me, my best defence is to use my own abilities to prove my worth in society," Yu said. He plays the guitar, is learning the saxophone and says he must move beyond singing cover versions to writing his own songs. He makes a living singing in pubs and bars and at concerts, which is how he met his girlfriend. Yu, who draws inspiration not only from Western artists but also from Taiwan pop stars such as Harlem Yu, has not yet cut an album, but hopes to do so in the second half of this year. "If I had a choice now, I would want to keep all my hair," said Yu. "It's become my pride and not a burden." But he also says he wishes he had been born a long time ago. "Because in the olden days, having a lot of hair was a show of masculinity."